Emotions became heated, at times, during a Senate committee hearing, held last week in Canada, to review proposed legislation that would create a national strategy for Lyme disease. Bill C-442, An Act Respecting a Federal Framework on Lyme Disease, has passed the House of Commons and is now before the Senate. 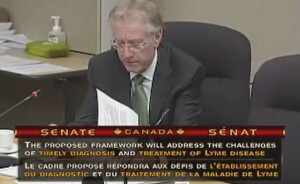 Senator Art Eggleton addresses committee regarding Lyme disease bill. While many of the points addressed in the Bill have been agreed upon by all stakeholders at the meeting, certain wording within the bill has created concern for infectious disease specialists, who argue that it suggests support for ‘pseudo-science’ treatment guidelines, while dismissing current evidence-based guidelines put forth by the Infectious Disease Society of America (IDSA). In essence, they argue that those who support the bill, support the International Lyme and Associated Diseases Society (ILADS) guidelines over IDSA guidelines. “The data that Lyme advocates put forward has no proven clinical relevance,” he told CBC Radio. The AMMI Canada is also concerned the bill supports the idea that there are significant numbers of Canadians suffering from ‘chronic’ Lyme disease, who are being ignored by the medical community. And, that the current diagnostic guidelines, developed by IDSA, are too restrictive and miss large numbers of Lyme disease cases. In the video clip below, Senator Art Eggleton questions Dr. William Bowie, infectious disease specialist, about the patients suffering from Lyme disease symptoms. Dr. Bowie explains that most patients suffer from Chronic Fatigue Syndrome. In the video clip below, Dr. William Bowie, infectious disease specialist, questions accuracy of specialty lab tests for Lyme disease. May pointed out that the bill is based on scientific evidence and the Public Health Agency of Canada, Health Canada, the Canadian Medical Association and the College of Physicians and Surgeons of Canada have all expressed support for the bill. “[Lyme disease] is a rapidly spreading disease. … For doctors, Lyme disease presents a real challenge,” she stated. Laboratory tests are inaccurate, yet physicians in Canada are relying on those tests in making a diagnosis, even when a patient presents with objective symptoms. Most physicians, she said, still believe that in order to have Lyme disease, a patient must present with the classic bulls-eye rash. After sharing his family’s personal struggles with the disease, Jim Wilson, president and founder of the Canadian Lyme Disease Foundation summarized his hopes in passing of Bill C-442. I would like to point out, that there have been limitations identified in the 2000 and 2006 IDSA guidelines, as well. Two studies have found the IDSA guidelines short on evidence for a range of infections, not just Lyme disease. There are concerns with both ILADS and IDSA guidelines. The 2014 ILADS guidelines address many of these concerns, except for the definition of chronic Lyme disease. This was not addressed in the document, because the focus was on treatment. ILADS developed its set of guidelines because the infectious disease guidelines fall short of meeting the needs for diagnosis and treatment of individuals with chronic Lyme disease. IDSA guidelines fail to take into account the compelling, peer-reviewed, published evidence confirming persistent, recurrent and refractory Lyme disease and, in fact, deny its existence. Because of the complexity and variability of Lyme disease symptoms, ILADS guidelines are flexible. Treatment depends upon the severity of each case, the patient’s response to therapy and the physician’s own clinical judgment. “It’s an incredibly damning statement against science [IDSA] and support for pseudo science [ILADS] … I think it’s going to contribute to further difficulties … managing people with Lyme … it’s going to have negative impacts on the manage of people in Canada,” he insisted. “I really disagree with you. I know … that many medical practitioners in Nova Scotia until recently denied that Lyme disease even existed,” Senator Kelvin Ogilvie replied forcefully. Lab tests – good or bad? “The vast majority [of Lyme disease patients] have so-called positive test results from for-profit laboratories that use non-standardized methods and that give test results that are discrepant compared to standard methods,” he explained. “The for-profit laboratories have their own internal methodology … they have steadfastly refused to participate in any of the standard evaluations that would be done to … any diagnostic test we use,” he continued. Actually, Dr. Bowie’s statement is inaccurate. Tests that are marketed to other labs require FDA approval. All diagnostic tests do not require FDA approval. In fact, there are a tremendous amount of diagnostic tests used for common diseases that are not FDA approved. Even commercial laboratories, such as Quest Diagnostics, provide certain tests that aren’t FDA-approved. Instead, federal law requires that specialty labs, which Dr. Bowie is referring to, undergo a rigorous validation process established by the Centers for Medicare and Medicaid Services (CMS) and Clinical Laboratory Improvement Amendments (CLIA). The United States medical community has wrestled with this disease at every level – ensuring dissemination of accurate educational and prevention information, tracking of both the tick population and new disease cases, and development of better diagnostic tests and treatment options. I hope our Canadian colleagues will allow us to share what we have learned in the United States in managing Lyme and other tick-borne illnesses. Patients need all parties to come together, with complete objectivity and untainted political agendas, to tackle this disease. Patients need both the research and academic sectors, as well as treating physicians, like myself, who have been on the frontline clinically, to share their knowledge and expertise. 11 Replies to "It’s Chronic Fatigue, Not Lyme, infectious disease doc tells Senators"
Peter Kemp in England has Chronic Fatigue Syndrome (called ME in England). Even though he and 10 others with chronic fatigue syndrome had negative tests for borellia burgdorferi, (lyme disease), Peter, amateur microscopist, cultured spirochetes from the blood samples of every one of them. So, the test they use is very specific, and it does not pick up every species of borellia. But Peter grew spirochetes from Chronic Fatigue Syndrome in multiple people, If it is not lyme disease, what is it? Peter’s website is called councilingme and it has lovely pictures and video of the spirochetes. We have an incredible problem of industry hacks posing as setting up astroturf organizations and then posing as concerned doctors to get us to continue to use useless tests. There are at least 30 species of borellia that scientists know about. It is mind boggling that they only test for one and then tell very sick people that they are not sick at all based on the test! Why not do some live cultures from blood and skin samples and actually see the microbes before you dismiss them? Thank you so much Dr. Cameron for your excellent discussion and astute comments regarding the Senate hearing. We look forward to hearing your input on this week’s hearing as well if time permits. My daughter Nicole (age 22) has been very fortunate in that all of her treatment has been under the guidance of intelligent, open-minded doctors in the US. When Nicole & I set about meeting with ninety members of parliament in June of 2013 and more than two dozen senators we hoped but never dreamed of unanimous support in the House. I now expect we shall see the same support in the Senate. There is much hard work that needs to be done when the conference is convened. In order to keep on track and of benefit for both patients and the training that will be rquired of the medical profession, I would appreciate any help ILADS might bring to the table. Thank you for having the courage to point out that the evidence-base for making strong treatment recommendations regarding the treatment for chronic Lyme disease is lacking. As such the ILADS treatment guidelines, which base treatment decisions on patient response to treatment and on patient values is reasonable and ethical. If Doctor Bowie is indeed on the IDSA guidelines review panel and if he continues to avoid any real scientific discussion of what is really known about Lyme disease by purposefully demeaning the peer-reviewed evidence-based ILADS treatment guidelines as pseudo-science, this does not bode well for the IDSA guidelines review process. Dr. Bowie’s assessment of Lyme is totally inaccurate. Lyme was never just about Spirochetes but about the Immune Suppression, low pH, chronic infections doctors like him use antibody tests to detect infections they don’t even make antibodies for because of immune suppression. And in HIS so called Chronic Fatigue the infectious organisms infinite ability to recombine in gross conformations grow in the skin, guts, and brains of those already suffering syndromes, psych, and cancers infections have ALWAYS been the cause of. The people of Canada have NO time for more gross negligence, more obstructions of the truth, more ridiculous medicine if you are going to save people instead of KILL THEM. Already every child is being born infected. And its NOT CFS. this type of close-minded thinking by dr. bowie and his colleagues is exactly why i spent 5 years of my life with debilitating fatigue, headaches, chronic daily fever, joint pain, brain fog and countless tests that all showed negative. i was “set free from their practice” when they ultimately assigned the diagnosis of chronic fatigue syndrome and fever of unknown origin. 2.5 weeks later, i ended up in the ER with lyme meningitis and blood clots. if you ask me, it’s the diagnosis of chronic fatigue and fever of unknown origin that are the “pseudo science” approaches to diagnosing and treating patients. every chronically ill patient who is sent home with either as a diagnosis feels they’re being sent home to die. in my humble opinion, it is the very fact that the science can be so hotly debated that suggests the science is flawed on all levels. Just wanted to add that the 0.3% prevalence figure is also that of the other widespread definition of ME”cfs”, CDC’s 1994 Fukuda definition. After watching the video, I have to change my ‘position.’ Dr. Bowie says that Canadians who ‘think they have Lyme’ really have chronic fatigue syndrome, or at least chronic fatigue, which affects 5% of the general population. He is correct that something like 5% of the general population has Idiopathic Chronic Fatigue (ICF), ie the ongoing symptom of fatigue attributable to no known cause (note ICF is NOT ME”cfs”). He is of course wrong about patients having ICF and not Lyme, since some of these patients who “think they have Lyme” actually have positive PCR + Southern Blot or are positive by culture. Also, no person who “thinks they have Lyme” has only chronic fatigue as a symptom, so what about all the other symptoms. He claims that Elisa + W. Blot is very accurate for detecting late stage Lyme. The guy is clueless or lying. Either way, he is patently incompetent to testify on this subject. Many of the doctors and now politicians are guilty of Parroting bias….i.e they repeat false information. I was bitten by a tick in Australia, developed the bullseye rash, severe fatigue and mental fog and had an equivocal test result. (the elisa test will be negative if done too early, and negative if done after antibiotic treatment) Yet I can not be treated for this by the Centre for Disease control because they were parroting the “there is no Lyme in australia” Well, guess what? Australia has now admitted that there is a Lyme like illness. The testing is flawed. Fortunately I was able to get treatment (long term antibiotics from another source and I am amazingly better. Dr Bowie would have claimed I had chronic fatigue and denied me treatment. He should resign. I still can’t believe certain physicians such as Dr Bowie are still saying the standardised tests are accurate when it’s well known and widespread that the current standardised testing ELISA & Western Blot are flawed and inaccurate! This is the exact mirror of the issues we are facing in the UK too right now. I was bitten in the USA during the 1990’s had typical bullet rashes two of them and since been bitten at home in Wiltshire UK. Wiltshire is only 15-20 miles from Porton Down (the UK’s very own Plum Island!!) my UK standardised testing was of course sero negative I knew it would be and I was diagnosed With Fibromyalgia, ME/CFS in the 1990’s I believe I have chronic Lyme I have so many Lyme symptoms. I have conversed with Dr Richard Horowitz about my case and he says with bite history and my symptoms, that alone on my clinical symptoms that they are indicative of chronic Lyme and co-infections. So far to date I’m currently un-treated and I cannot afford to pay a private lab for more thorough testing as I’m bed ridden and too sick to work for the last 4 yrs I’m being failed by the UK & the NHS left to waste away and deteriorate! I’m also a single mother and my kids need me to be here for them! I’ve also because of the Lyme/co-infections got a messed up immune system, I’ve also had many many surgeries for HPV tumour growth, HPV cancer where most people can fight the virus and recover it keeps attacking my body and producing tumours needing radical surgery I’ve had over 26 surgeries in the last 10 yrs. As a patient group globally we are huge we are being ignored and left a painful pitiful existence until we succumb to this horrible disease and die. We need help we need proper accurate testing, supportive medical professionals, correct diagnoses not mis-diagnoses and decent and timely treatment all done on a case by case basis. Thus if someone is still sick with chronic Lyme they can get better long term treatments and therapies. The arrogance and ignorance and damn right mistruths surrounding inaccurate standardised testing and proper treatment, needs to change no more denial no more blaming the patients mental state for the tirade of physiological symptoms and medics being lazy not diagnosing properly with clinical symptoms instead relying on inaccurate flawed standardised testing then giving these patients a mis-diagnoses and then subsequently signing them a death sentence with no recognition or treatment!!!! This has to change the suffering HAS to STOP!! !